Stewart House and Smith Family School Clothing Collections. Stewart House has been working in partnership with The Smith Family for more than 50 years. 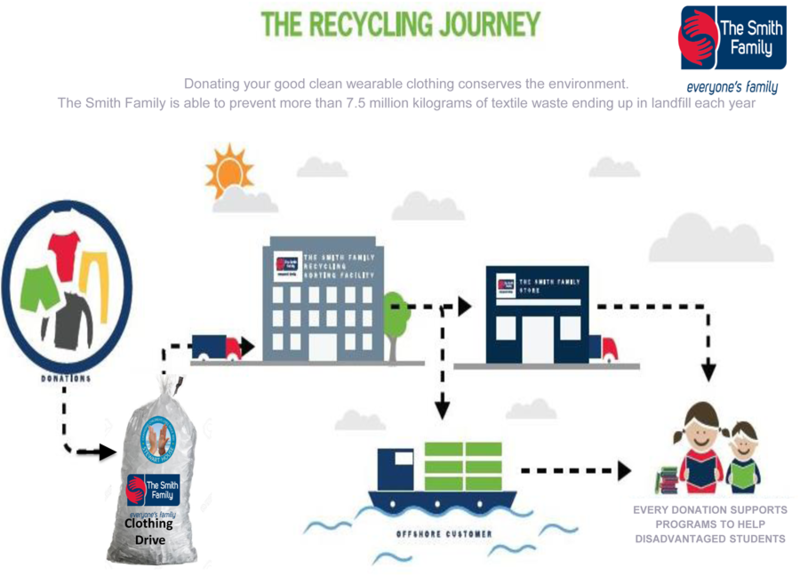 The Smith Family’s Recycling Operation helps schools in NSW run clothing drives. Donations of new and/or good quality clean clothes, accessories and Manchester provide stock for The Smith Family’s retail stores and overseas partners. The better quality the donation, the greater the impact. School clothing drives are an important source of good quality new and near-new clothing, helping to keep our stock levels high. The Smith Family generously provides bags and undertakes the collection and pays Stewart House for each kilogram received. About $18,000 is raised each year from this collection. Step 2: Nominate your program – Choose an annual or periodic recycling event. Step 3: Nominate your collection method – Collection bags, collection bin or both? Step 5: Collection and Reporting – We will provide you with recognition for your involvement.